Pilot recruitment is a complex global marketplace with an acute talent shortage for experienced Pilots. In particular, the demand for Pilots in Asia has increased significantly in recent years. This huge global requirement for Pilots is causing airlines to be faced with a new dilemma in their search for Pilots – lack of experience, not skill. Experienced Pilots are in high demand and they know it. Experienced pilots are not unemployed, and they are not walking the streets. Pilots are employed and are being “bear hugged” by their airlines, and those actively recruiting for growing fleets are not finding these Pilots easily. Only 10% of qualified Pilots are actively looking for a new job. They may be worried about their current job security or already be out of work. The fierce competition between airlines, as well as the pressure to keep air travel costs down, has forced mergers, buy-outs and administration more frequently in recent times, and for the Pilots involved, some uncertainty in their careers. These candidates tend to apply for lots of Pilot jobs as well as ensuring their CV is visible on the top Pilot job boards. You will see them on LinkedIn and sending speculative CVs. They may feel that they have restricted career options, especially if their flying experience is limited. A staggering 60% of experienced Pilots are passive candidates – they are employed, and not looking for a new opportunity. This group of Pilots is being contacted by Pilot recruiters repeatedly and they receive numerous ‘work for us’ messages on LinkedIn every day. They don’t have an up to date CV because they don’t need one and they don’t see the value in investing time in it. They have lots of choice available to them and when they are ready to make a career move, they will have plenty of choices in the market. At GOOSE Recruitment, we affectionately call this group of Pilots the ‘tip-toers’. They have a good Pilot job but are ambitious and striving for a better one. They may not be actively applying for new roles, but they are prepared to make a move, for the right job. Beware though, these ‘tip-toers’ will be cautious with their intent of interest and will be worried about making the wrong decision. This is where brand reputation will be very important for airlines. These ‘tip-toers’ will be seeking assurance from their network about your airline and will require a lot of handholding by your recruitment team. Tread carefully with ‘tip-toers’, these could be very valuable candidates, but need to be handled with care, and persuaded gently. How are Airlines (and some recruiters) approaching Pilot Recruitment? There are some Airlines and recruiters who are relying on traditional methods of Pilot Recruitment. The ‘post and pray’ approach is commonplace and sees internal and external recruiters advertising Pilot vacancies on job boards, sitting back and waiting for responses. Just-in-time hiring has become the norm and futureproofing employee gaps are unusual. Recruiters are not creating a value proposition and can provide a poor and unfriendly candidate and recruitment experience. In a fiercely competitive market for pilots, recruiters are failing to realise the reality that Pilots have choice, and lots of it, and they need to see added value to choose that airline or that recruiter to work with. Times are changing and there is a new name in Pilot recruitment with a new approach. 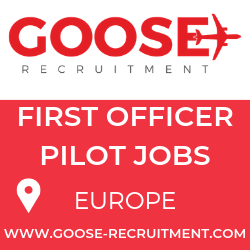 GOOSE Recruitment has entered the Pilot recruitment market with a fresh, new approach. This has been developed using our expertise from a number of global candidate short, and high demand markets, gained by the experience from our parent company Faststream Recruitment. We bring new ideas and ways of working. 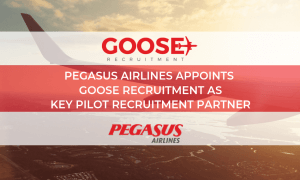 The GOOSE Recruitment team are not pilots who have set up a recruitment business; we are recruitment experts who have set up an aviation recruitment business. Our ethos is ‘High-Touch’, not ‘High-Tech’ – Pilots are people and are not robots or a piece of data. They need to be persuaded, cared for and nurtured. A computer cannot sell your job for you and we never rely on one to do so. We will. GOOSE plays the long game with Pilots and Airlines, not the short term gain. We treasure connections with Pilots and Airlines and invest in future relationships. Our Pilot friendly recruitment experience sets us apart from the rest. We want to speak to Pilots, not send faceless emails. Our well-developed sourcing strategies ensure we speak to the right people, make the right connections and use headhunting methods to find the right Pilots for our valuable clients. We constantly benchmark our recruitment processes and are not afraid of change. To facilitate this new approach to pilot recruitment, we have already set up offices in three global hubs – the UK, Singapore and Houston. Our global locations, as well as holding our GOOSE networking events and attending key dates in the aviation calendar, we are available to airlines and pilots across the globe in person, rather than relying on traditional high-tech methods. GOOSE is high-touch and we want to hear from you – contact us now to find out more.